We brought to you the confirmed news of the launch of Avenger 220 on June 15th and here we come again with the actual snaps of the bike along with a detailed first look. Actually, it was just a wait of time before we saw Bajaj took this step. Avenger has been a sole product in this segment in India and currently doesn’t have any single competition to bother about. Yamaha tried their bit with the 125cc Enticer which did not yield them the expected results. And if you feel that we are forgetting the Royal Enfields, we really don’t feel there is any (we literally mean ANY) competition between these two brands. Bulleteers are a different creed! A ‘soft’ bike like Avenger is majorly an attraction for urban youth who want to own a comfortable ‘cruiser-alike’ bike. ELIMINATOR: It all started with the word ‘Eliminator’, the bike which was a Kawasaki product, essentially, and created a huge furore in the market when it was launched in 2001 in India. It was a big gamble from Bajaj as the market back then was majorly confined to smaller bikes. A price tag of over 90k back then meant a moon for the masses. 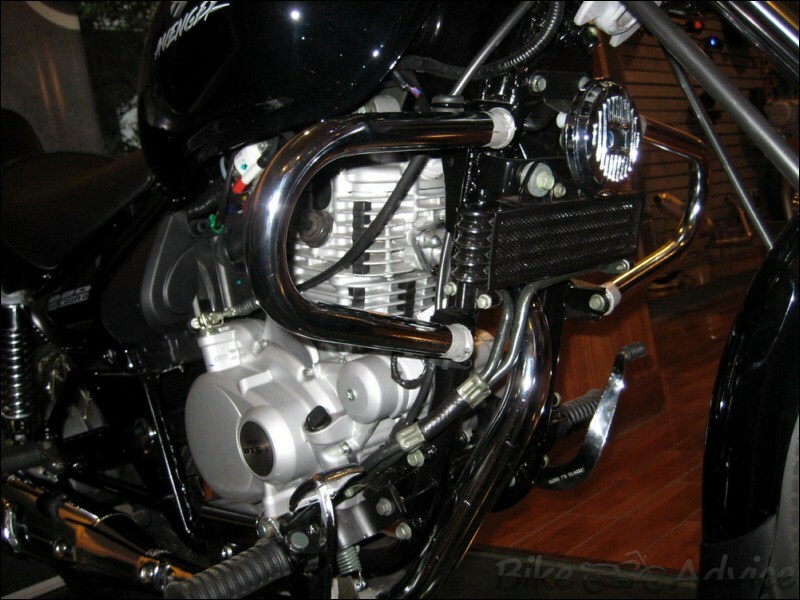 Eliminator had a 174cc engine imported directly from Kawasaki’s stables, which was capable of producing 15PS of maximum power and 13.7Nm of peak torque. 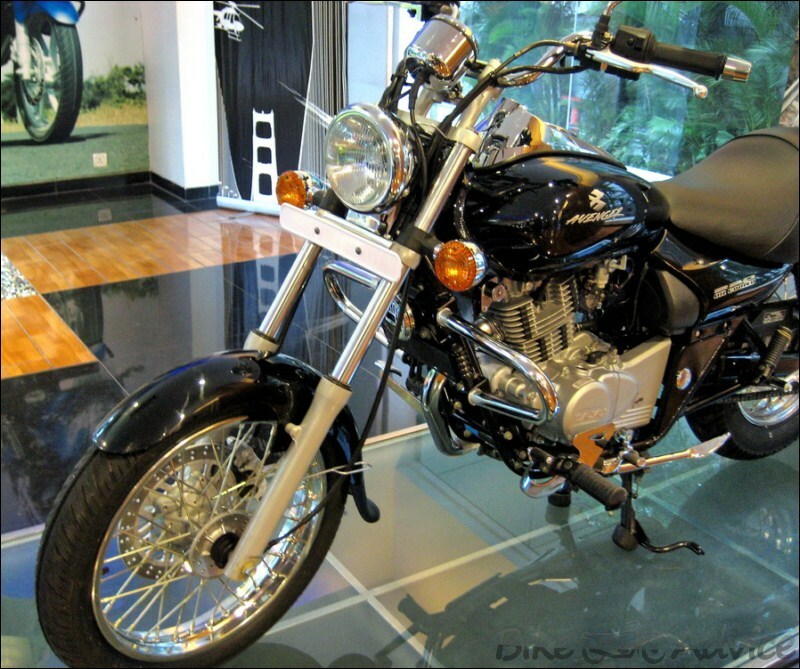 EL175, as it was called in the Kawasaki’s stables, enjoyed a good share of success until 2005 when Bajaj decided to revamp the whole concept; and Avenger, the most affordable cruiser experience was born! AVENGER 180: Bajaj stopped Eliminator and launched a similar looking Avenger on 10th June 2005 (which happens to be the birthday for Rahul Bajaj) with a different engine and a huge 30k slash! This huge reduction was attributed to the fact that the bike shared the same engine borrowed from the then eldest Pulsars, Pulsar 180 DTSi and all the parts were indigenous Indian, manufactured and assembled by Bajaj locally. Under this tune, Avenger’s 178.6cc DTSi engine produced 16.5 bhp of maximum power belting out 15.22 Nm of peak torque similar to Pulsar 180 DTSi. 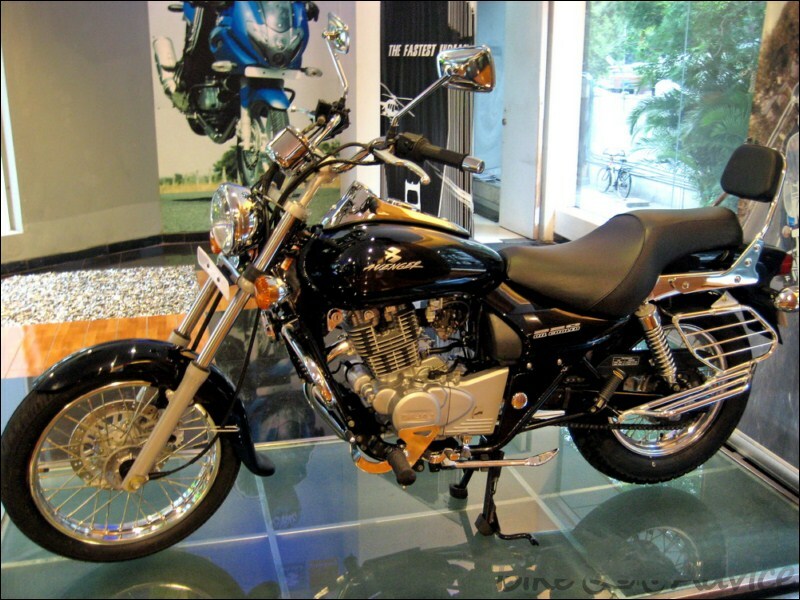 AVENGER 200: After a grand run, Bajaj decided to upgrade the bike with Pulsar 200s mill and Avenger 200 was introduced in 2007 with a very little price increase and an introduction of ‘Oil Cooling’ on this bike. The 198.8cc air cooled (with oil cooler) mill of Avenger was tuned to a different tune from the Pulsar 200s and produced a healthy 17.5PS (@8000rpm) of max power and 16.7Nm (@6000) of swirling torque in contrast to Pulsar 200s 18PS and 17.1Nm respectively. With each iteration the product has been enhanced (probably barring the Eliminator’s!) and riders have come close to simulating a more cruiser like experience. AVENGER 220: In comes another upgrade to the bike and this time it has been endowed with ‘The Fastest Indian’, Pulsar 220 DTSi’s heart. Avenger 220, as Bajaj calls it, takes the game a step ahead and up close to the ‘Feel Like God’ theme the bike has been known for. Here is what Bajaj has in offering with the new product. ENGINE & TUNE: Up from the 198.8cc engine of the Avenger 200, the new bike churns out a 21cc higher displacement of 219.89cc. Avenger 220 sports a 4 stroke, single cylinder, air cooled (with Oil Cooler), DTSi engine directly borrowed from Pulsar 220. Power output is up by 1.5PS to 19.03 Ps and is generated at 400 rpm over the earlier variant at 8400rpm. Torque has been bumped by 0.8Nm and the bike now produces 17.5Nm of twirling torque which peaks at 1000rpm late @ 7000rpm. The fact that peak figures are produced at slightly higher rpms hints to the slightly changed character of the bike which is now expected to be relaxed in nature under high speed (rpm) cruising. However, as compared to Pulsar 220 these figures are kept low keeping the cruiser aspect of the bike in mind. Factually, Avenger 220 produces 2PS of power and 1.6Nm of torque lesser than Pulsar 220. BIGGER OIL COOLER: The 200cc version of Avenger also had an Oil cooler and the new bike finds itself laden with a bigger oil cooler which has 33 percent increased area. 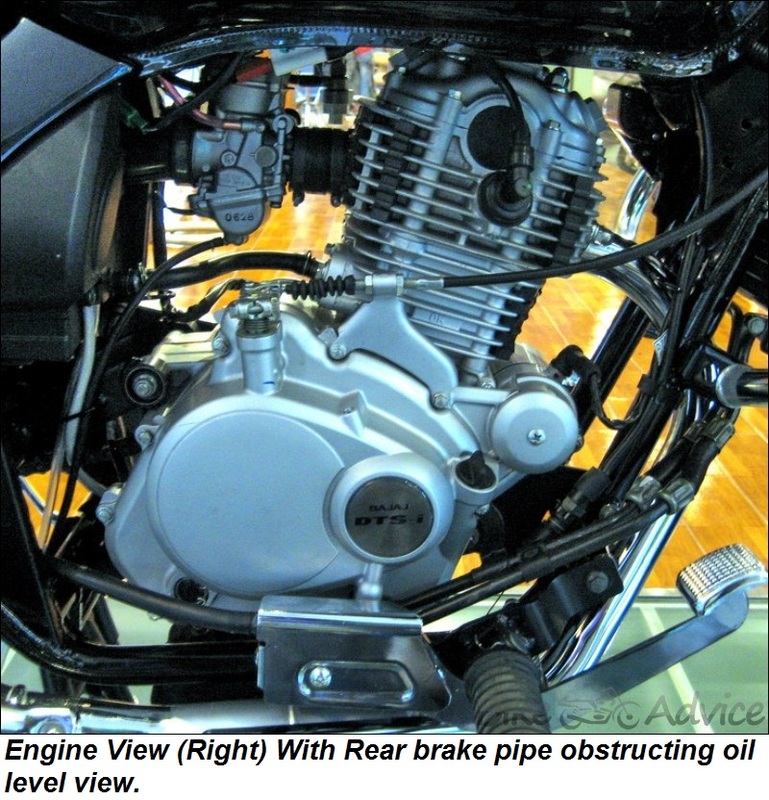 Avenger 220 now has 4 chambers inside the oil cooler as compared to 3 in the earlier version to ensure optimum cooling of the bike with minimal power drop under extreme needs. NEW LOGO: The bike looks exactly same as the earlier variant and only the rebranded badge of “220 OIL COOLED” at the side panels differentiates the bike from its earlier sibling. ALTERED EXHAUST: We hear that the exhaust has also been altered with, for providing a better low end torque; however, on the looks of it, it looks similar to the older version. OMISSION OF KICK: Similar to Pulsar 220, the bike does away with a kick starter. The bike gets an Electric start as the sole mode of pushing the bike to life. With no major issues reported on the earlier kickless versions Bajaj has launched of late, this move doesn’t seem to be any worry, however, with ample amount of space on this bike, Bajaj could have opted for a kick starter as well. 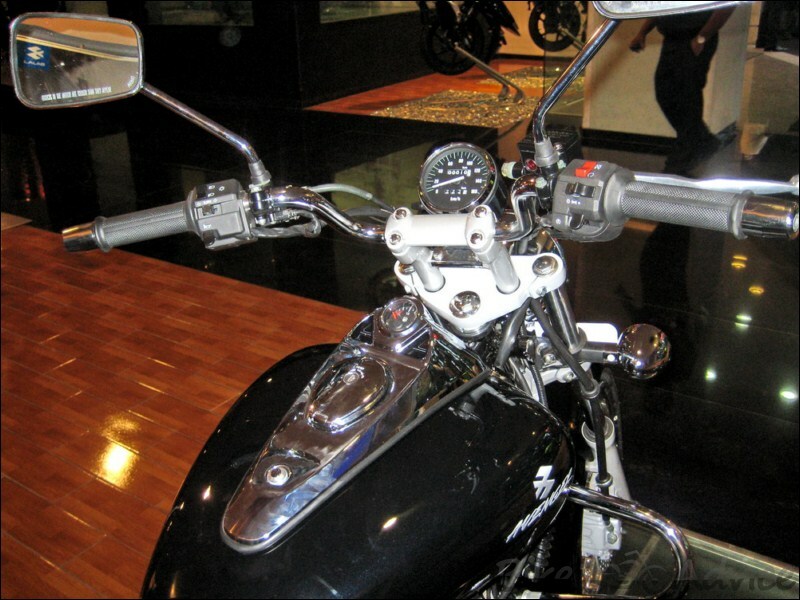 DC Ignition: A welcome change is the inclusion of DC ignition which would help the awesome 55W headlamps of the bike to continue shining as bright under all rpms. IMPROVED BRAKING: Though the front remains the same 260mm Disc, the rear 130mm drum arrangement has been modified to provide better control of the bike. We hope that the spongy feel of the brakes has also been taken care of. Low Battery Indicator: Avenger 220 also has an indicator which informs the user when the battery is running low on charge to help timely service/recharge/change of the battery. Dual foam density seat: Of all the seats our butts have relaxed on, Avenger’s have probably been the most padded and this bike carries the same advantage forward. Weight: Despite the bigger engine and mentioned changes, Bajaj has been able to keep the weight under control at 154.5kgs (excluding the optional windshield). Colors: The bike will be offered in same colors as the earlier iteration: Plasma Blue, Cocktail Wine Red, Mist Grey Silver, and Midnight Black. 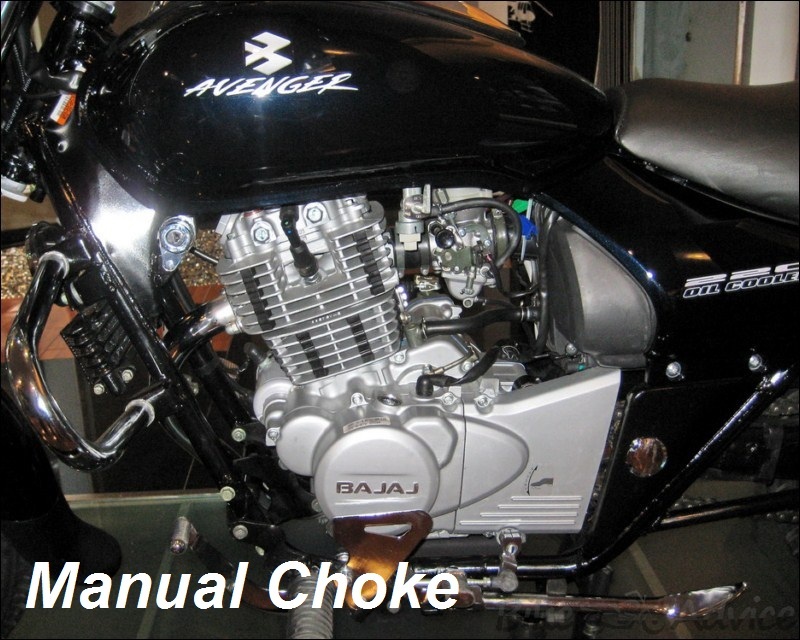 Manual Choke: Apart from the engine tuning difference, Avenger has a manual choke placed right around the carburetor, in contrast to Pulsar 220s auto choke. With each iteration the two best possible things which Bajaj have done are: keep the retro-urbane styling constant and two, keep a sensible sticker price. Avenger in its latest 220cc avatar is dearer by around Rs 4000 compared to the earlier Avenger 200 despite a bigger and more powerful heart and the above listed enhancements. Avenger costs Rs 76,876 all inclusive without the transparent windshield where Avenger 200 costed Rs 72,500. Compare it with the cheaper (of the two) variant of the 220cc mill, Pulsar 220S which sells at Rs. 79,125 and Pulsar 220F which sets your pocket lighter by Rs 82,400. So effectively speaking, you get a lot more upfront performance, better pulling power and a relaxed nature at higher engine revs, all at a price which is the least for this Bajaj’s 220cc mill and offers a whole lot of goodies. The bike has been made available for booking in the ProBiking outlets of the company by Bajaj and after a few legal procedures deliveries of the bike would commence.